What happens when a slow-flow yoga teacher and HIIT instructor trade places? Read on. Join Mary Beth LaRue and Jacy Cunningham as they lead the free 10-Day Wellest Challenge, beginning September 10. Sign up for *FREE* and be automatically entered for a chance to win a free trip to Wellspring in Palm Springs! What happens when you ask a slow-flow yoga teacher and a HIIT instructor to trade workouts? You get some pretty interesting (and by interesting, we mean hilarious) results. Beginning September 10, HIIT instructor Jacy Cunningham and yoga teacher Mary Beth LaRue are tag-teaming the Wellest Challenge, a 10-day video course combining high cardio workouts with restorative-style yoga. These online video challenges were made popular with the beloved 21-Day Challenge from Schuyler Grant, but this was our first one combining two Wanderlust teachers. To celebrate, we made them work. Below are Mary Beth and Jacy’s diaries after spending three days trying out one another’s workout routines. Mary Beth took on Jacy’s fast-paced cardio workouts while Jacy cut his teeth on some gentle vinyasa. Read on to witness their experiences. Sign up for the Wellest Challenge here! Signing up is FREE until September 19. Currently my fitness practice combines elements I’ve discovered over years of travel, primarily from communities in Latin America (Rio de Janeiro, Brazil) and Asia. These elements involve breath work, high intensity movements (HIIT) mingled in with slow controlled movements, and much meditation. I utilize HIIT training because I fell in love with the fitness principle “time under tension.” Establishing a specific time under which to execute movements has shown me wonders about our ability to push past the “I can’t” in life. After 10 years of being a Movement Instructor, I’ve truly found peace in my work. Being a Fitness Instructor is more than meets the title; it’s the countless conversations outside of the workouts that make the real impact. It’s the two-hour phone conversations about nothing fitness-related that brings about the connection and grounding necessary for transformation. I’ve always recognized the divine space which God has carved out for movement. When we move, we release. We release stories of “we’re not good enough” and transform them into power. That’s what my method is all about; helping humans turn trauma into power, to be able to connect through love and play. When the content team at Wanderlust asked me to mix it up and try a restorative yoga practice, I instantly gasped. I’ve taken tons of yoga classes, but typically I aim for higher-intensity styles, such as Bikram. This opportunity to slow down and restore was very interesting to me. We live in a society that’s constantly telling you to hustle, hustle, hustle; to sleep when you’re dead. These patterns have created tension within my collective and personal communities. Slowing down these days has become a sign of weakness—and in our hyper-masculine world, who wants to be weak?!? We hear these types of iterations often and they remind me of the need for all of us to view wellness in its entirety. It isn’t just yoga, or HIIT, or spin, or meditation; it’s everything! So when I began the guided practice from Mary Beth, I was both excited and apprehensive. Day 1. I’m not going to lie, I was not expecting to sweat so much through a restorative practice. From the first prayer pose to the ending Savasana, the transitions were fluid. I could, for once, feel each and every muscular engagement through the flow; I felt my front body opening in numerous ways. Full of twists, the class offered me an opportunity to fully tune into the present moment, using my body to soften into my breath and awaken from the inside. After a decade of pushing my body through sports-specific training, I am always shocked by how applicable the yoga discipline is, and how slowing down can be just as strong as speeding up. 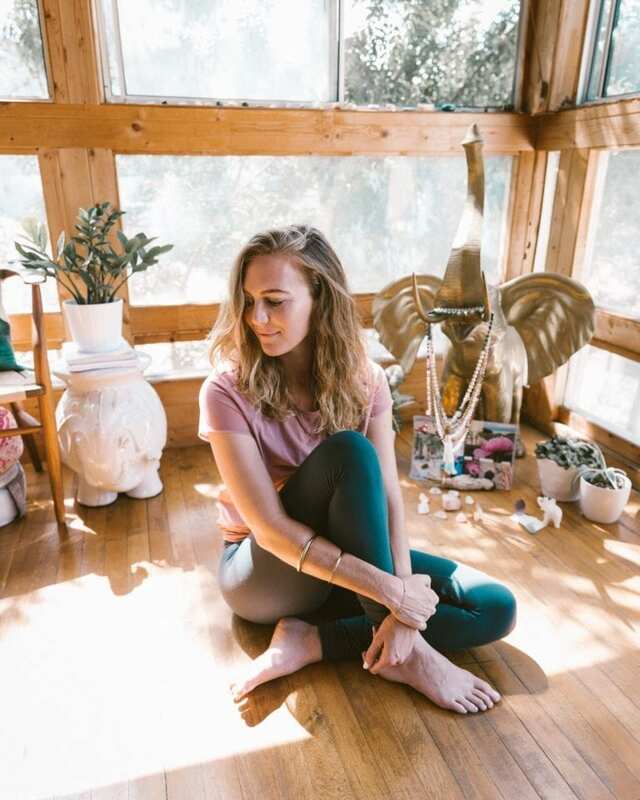 Mary Beth created such a gorgeous opening flow; and an hour after the practice my hips seemed more alive and this feeling seemed to permeate through my entire body. Day 2. If I were naming this class, I’d call it “Hammy Time.” Mary Beth created a fluid sequence of movements focused at releasing tension in the hamstrings, which is always a problem area for a lot of athletes, especially those who are involved in large power demands within their sport. As a jumper, I have developed considerable pain points below my knee, which I can attribute to a repetitive stress pattern of jumping over the last 20 years. I definitely struggled with a couple of the poses, especially the Standing Split. My body shook uncontrollably as I tried keeping my leg floating (I might have lowered it once or twice, haha). Nonetheless, I am proud to say that I made it through. Day 3. I can successfully say that after Day 3 I have fully become a chocolate pretzel. During the practice Mary Beth moved through a number of twists, opening up the shoulders and mid-back. An interesting thing to note about this specific practice was the amount of emotional moments I experienced. Each twist seemed to uncover a layer of emotions which may usually have been ignored. It’s like my body was speaking to me; each push and pull forcing me to listen. I wish you all could see how difficult some of the poses actually are for me but thank God for the previous couple of days with Mary Beth which highlighted areas of my body and overall movement practice which I sometimes ignore. Conclusion. BOY!! What an amazing three days of practicing with MB. It was a much needed reset for my body and mind. Each day I found myself discovering more and more areas of my body which need attention, as I travel often and am always in what I like to call “GO” mode which can take us away from our bodies sometimes. Slowing down has offered me such peace and clarity. We can all get lost in our work sometimes, which is why movement is such a necessary tool to bring us through these moments of stress. Although some of the movements were difficult, especially the split poses, I am pleasantly surprised at how my body reacted to the three days of practice: My hips are more aligned, I have less general pain in my knee, and a huge smile from within. When we dedicate time towards reflecting upon these gorgeous vessels of movement that we are, it brings us into alignment with our reality. A reality where each moment can offer us such joy and love; but we first must be willing to make the choice. Since becoming a mom eight months ago, I’ve had a lot less time to workout. My absolute non-negotiable every day is to meditate and I do a home yoga practice or hike three times a week, when possible. I know how much better I feel when I take the time to work a bit more cardio into my life but it’s not my natural inclination. Pigeon for an hour is more of my natural state. Ha. So making a shift into a HIIT workout was just that… A big shift. When the content team at Wanderlust asked me to mix it up and try a HIIT workout, I knew it would push me past my comfort zone which is exactly what I need these days! I liked that the workouts were so short and balanced. The length helped me ease into each regimen while simultaneously having fun. Jacy’s energy is so contagious. He made me excited to work out and to push myself. Having met him in person when we filmed this I know that’s exactly who he is—positive, energetic, a light in this world. There’s nothing forced or fake about it, which I love. Day 1. I love that Jacy goes over each movement and shows the correct way to do it. I kind of want to punch him when he keeps telling us to smile, but I feel energized and refreshed after listening to him. The workout feels doable but challenging. It’s the perfect base to begin with and I’ll be repeating this one for sure. Day 2. I’m sore. Is that normal? Is that sad? I know it’s important to stick with this so despite my whining, I do my high knees and all the things. I do get distracted by the gorgeous background of Palm Springs and imagine myself in a swimming pool with a frozen drink with an umbrella, but am able to guide myself back into the present by deepening my breath and sticking with it. I may be a sweaty hot mess, but at least I’m channeling Beyoncé. Day 3. I’ve met the Burpee before and we are not friends. But that being said this program has prepared me to move into it with a foundation of strength, alignment and dare I say it… Positivity? I love that the program builds as we go, and am extra glad that there’s slow restorative yoga to accompany it. At this point, my muscles are hungry for it. Conclusion. I’m in a space where being kind to myself is of the utmost importance. After doing this challenge I see that moving my body in this way is exactly that—it’s kind and empowering and gives me the energy to show up in this world in a big way. It gives me the encouragement to show up as a mama, wife, teacher… All the things. I will be incorporating many of these elements into my weekly practice and repeating Jacy’s videos. But you’ll also find me in Pigeon. Often. Join the 10-Day Wellest Challenge!